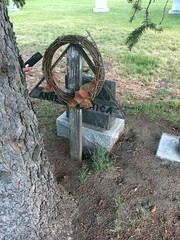 From June 14 to June 16, team Wolf Paranormal explored the towns and histories of Blairmore, Bellevue, and Coleman, in Alberta’s Crowsnest Pass. We toured the Bellevue Mine, we paid homage to the 189 miners buried in Hillcrest Cemetery, and we met with a representative for the Municipality of the Crowsnest Pass about a location consisting of two large buildings with a history of hauntings. The buildings had been cleared for safety… and then, a rig driver backed into one of them, punching a large hole in one corner, which resulted in the release of previously contained mercury, asbestos, and other dangerous compounds. When the cleanup is finished and the buildings have been cleared for safety again, we can go in. Due to the vastness of the area to be covered, we expect this investigation to take two full nights. We also met with curators of a museum, a former miner’s hospital, and an information center about hauntings occurring in their buildings. We will be conducting an all-night lock-down investigation in the museum, and spending several hours investigating the information center. The curator of the info center will be with us. The former miner’s hospital, however, is unavailable due to safety issues: The upper floor – which is where the activity tends to occur – is deemed by the town’s building inspectors to be unsafe, and no one is permitted in the building after hours. oh wow I can’t wait to see what you got!!!! Sounds exciting! Doing an all-night must be nerve racking!